Passiontide (Passionalia) is the historic name for the last two weeks of Lent. From ancient times these two weeks were called "The Great Week" (Μεγάλη Εβδομάδα) and "Passion Week". It was not only the last week as Holy Week, but the fourteen days from Passion Sunday until Holy Saturday. But is Passion Sunday (Dominica Passionis) the Fifth or the Sixth Sunday of Lent? This is a difference between the One Year Series and the Three Year Series. In the Historic Lectionary the Fifth Sunday in Lent is called Passion Sunday and the Sixth Sunday is called Palm Sunday. The Three Year Series arranged by the ILCW has assigned the title Passion Sunday to the Sixth Sunday along side the title Palm Sunday. This they did following the lead of Vatican II in its Revised Common Lectionary. This move to incorporate Passion Sunday together with Palm Sunday is new. However, in past three centuries historians from the Western Church have been occasionally confused. Apparently this is due in part to a misunderstanding of the habit of some of the Eastern Church to name some of their liturgical weeks by the title of the Sunday following the week rather than by the title of the Sunday beginning the week. The Greek term Εβδομάδα Μεγάλη, Hebdomada Megale, Medieval Latin: Hebdomada Magna: the "Great Week." According to Hildebrand and Hampson the use of these names as an equivalent to "Holy Week" (the seven days from Palm Sunday to Holy Saturday) started after the Reformation. Luther Reed's evidence may have been incomplete when he wrote that the term "Passion Week is no older than the nineteenth century and originated in Anglican circles." [The Lutheran Liturgy, p. 496] Reed's assertion that the term "Great Week" was used by Chrysostom with reference only to the week beginning Palm Sunday (ibid. 497) seems to be based a secondary citation of an observation made by Paolo Diacono in his Historia Romana which was written in 774. Hildebrand's De diebus festis libellus (published 1718) attributes the celebration of Passion Sunday to Pope Alexander I (died 115) and states that Ignatius had mentioned the Great Week in his Letter to the Philadelphians. [p. 62] [alternatively at google books] Unfortunately, the texts or versions of these writings available now do not seem to support this. Egeria (St. Silvia of Aquitania) wrote her travelogue Itinerarium Egeriae about her tour of the holy land in 381-383. In this she gave a fairly detailed description fast of the Forty Days of Lent (Lat: Quadragessima; Gk: Μεγάλη Τεσσαρακοστή), including the Great Week (two weeks before Easter), and Palm Sunday. (p. 57ff). THIS tide from this present day until the holy Easter-tide is called Christ's Passion Tide, and all God's ministers in the holy church with their church-services honour, and in remembrance hold his passion, through which we were all redeemed. Our books also say, that we should hold these fourteen days with great earnestness, on account of the ap- proach of the holy passion and honourable resurrection of our Saviour. On these days we omit in our responses 'Gloria Patri,' on account of our lament for the holy passion, unless some high festival-day occur during them. Both the Western Rite [Gregorian] and the 11th century Use of Sarum [England] were the main liturgical traditions out of which both the Anglican and Lutheran liturgical year grew. The Gospel Lessons in the Historic Lectionary from Lent 1 to Lent 3 have focused on the Authority of the Son of God over Satan and demonic powers. On Lent 4 (Lataere) the focus is on Christ as the Angel of the Lord who delivered His people from Egypt and provided bread for them in the wilderness. From Lent 5 (Judica/Passion Sunday) the persecution and punishment of Christ takes center stage. The focus of the Gospel lesson (John 8:46-59) turns to face what is coming on Good Friday. On Lent 5 is Christ's public confession that He is יהוה the LORD, the "I AM". And here is where "they took up stones to throw at Him." Though the particular lessons varied from region to region, the general arrangement came together by the middle-ages. And even the variation that existed by the time of the Reformation tended to emphasize the same themes for each week. The season of Lent itself had been formally tied to catechesis in canon law also by the time of the Council of Laodicia (363-364) [Canons 45-52]. 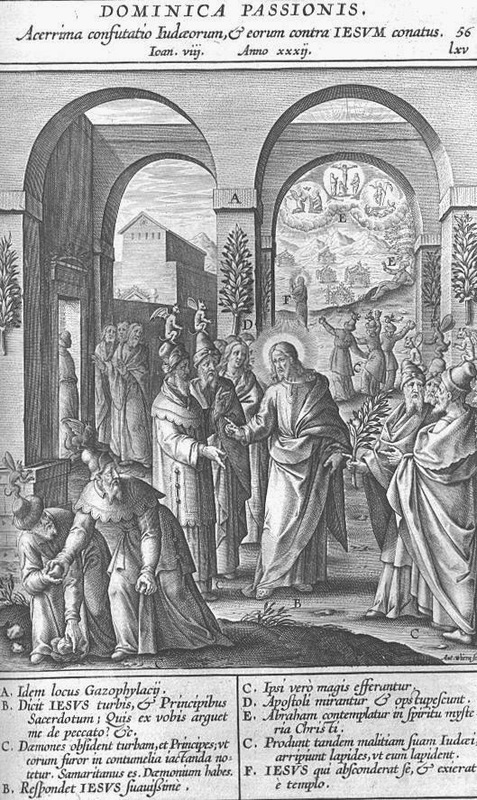 The LSB follows the ICLW arrangement for moving the name Passion Sunday to the date of Palm Sunday--even in the One Year Series (Historic Lectionary). However, even with the name move, LSB keeps the historic Passion Sunday (Judica) texts with Lent 5 in the One Year series. The editors of the LSB have gone to the work to put together a seasonally well coordinated set of readings for the major festivals of the Church year. The Lenten readings are found starting page 299. These readings are coordinated with the Treasury of Daily Prayer. The Treasury of Daily Prayer does not include a discussion on Passion Sunday in its words on the Church Year (p. 10f), nor at the place of the devotions on Lent 5 (p. 132) or Palm Sunday (p. 156). ELH retains the historic Passion Sunday texts with Lent 5 in its listing of the Historic Lectionary (pp. 202f). But the name of Passion Sunday is missing from this list. Neither is it included in the ILCW listings in the pages before this. ELH has a selection of hymns specifically for Lent 5 focusing on Jesus, Our High Priest (270-276). And a separate section on the Passion of Christ (281-308) which follows the hymns on Palm Sunday (277-280). A listing of lessons for Passiontide based on the Historic Lectionary in the ELH and LSB, the Use of Sarum, the Book of Common Prayer, and the pre-Tridentine Breviary. 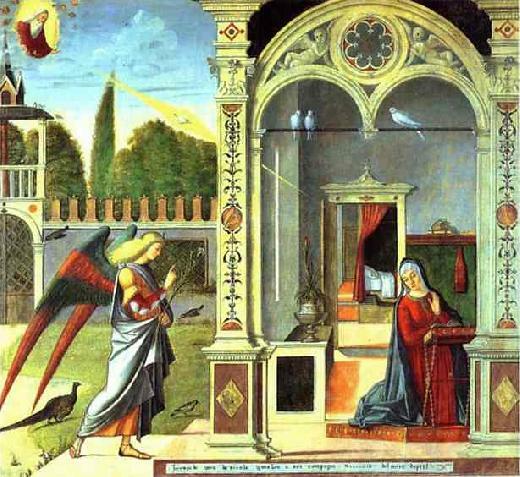 Annunciation (March 25th) is the day that the Church celebrates when the angel Gabriel came to announce to Mary that God conceived His eternally begotten Son in her virgin womb (Luke 1:26-38). The day marks the celebration of the Incarnation of the Son of God: the day the Church commemorates when the Eternal God came into His own creation as a human to redeem humanity from Satan, sin, and death. This day of Christ's conception is directly tied to the dating of all the Church celebrations surrounding Christ's birth (Visitation, Advent, Christmas, Circumcision and Naming, Epiphany, Presentation, Purification) as well as the dates the Church commemorates the events of the life of John the Baptizer. This is one of the earliest commemorations for which we have documentary evidence. The celebration of Annunciation on March 25 is common to the Eastern and Western Church. And the choice of the date is directly related to Easter and the calendar date of the year when the Church believed the world was created. ἔτη ρ δʹ μὴν εἷς ἡμέ ραι ιγʹ. Φαρμουθὶ ιθʹ πεπονθέναι τὸν σωτῆρα λέγουσιν. Φαρμουθὶ γεγενῆσθαι κδʹ ἢ κεʹ. 194 years, 1 month, 13 days. on the 19th of Pharmuthi the Savior suffered. As noted in a previous article in this series on Christmas: The important line is τῇ γενέσει τοῦ σωτῆρος ἡμῶν “our Savior's genesis.” The month of Pachon in the Egyptian calendar at that time corresponded to March in the Julian Calendar. This also is a bit of repetition from the articles on Christmas, but another example from the same period is Hippolytus of Rome (170 – 235). Between the years 202 and 211 A.D. the Church Father Hippolytus wrote in his Commentary on Daniel (section 4.23.3) about the date of the birth of Christ: which would place the conception or Annunciation 9 months prior. This evidence from Hippolytus of Rome shows that by the end of the 2nd century, the same era as Clement of Alexandria, Christians in Europe as well as Africa recognized March 25th as the date of Christ's Conception or Incarnation. The significance of March 25th was threefold: The Church Fathers thought the world was created on that day. They believed Christ was conceived on that day, and they commemorated Christ's passion as being originally on that day. The theological significance for the commemoration of this date was great. The dates the Church chose to commemorate the Annunciation and Christmas have been under attack from the time of the Puritans in the 17th century A.D. Increase Mather's attack on the dates of the Annunciation and of Christmas included the accusation that the date of Christmas was of pagan origin. However, as we have seen in previous articles, the attacks of the Puritans are shown to be false. The dates the Church chose to commemorate the Annunciation and Christmas were chosen earlier in history than most of the pagan practices listed by Mather can be shown to have existed. Some of the pagan practices listed by Mather were not related to the dates in any way and actually had no bearing on the choice of days for commemorating Annunciation or Christmas. In the mid-19th century the attack against these Christian liturgical festivals was renewed by Bishop Alexaner Hislop and other authors who tried through fake historical research to demonstrate that all liturgical practice and liturgical days of commemoration in the historic liturgical practices of the church were stolen from or derived from mystery religions in ancient Babylonia. Hislop and his followers were just as rabidly anti-Roman Catholic as their Puritan predecessors. In the late 19th century and through the 20th century another movement based on Modernism tried to demonstrate that the historical liturgical practices of the Church were stolen or adapted or evolved from pagan sources through cultural and sociological factors of religious conquest, assimilation and syncretism. These authors generally follow after Joseph McCabe's St. Augustine and His Age, p. 128 and Sir James George Frazer's The Golden Bough. These attacks are basically repetitions of Mather and Hislop. The only difference is the addition of secularism. More recently, the iconography of the Annunciation has been used by Erich von Däniken and his followers in an effort to prove that the earth was visited or even seeded by space aliens. Mather (Testimony, ch. 3, §4) seems to conflate "incarnation" (i.e., "conception") with "birth" in his reading of his selected sources. One of his main arguments against the traditional dates of Annunciation and Christmas is based on his ignorance of the climate in the region of Bethlehem. This applies to Mather's claims both the shepherds and the timing of the census. Mather's main argument that Jewish Rabbis claim that the Messiah should be born sometime near the Feast of Tabernacles (Tishri 15=Gregorian: late September to late October), and that the rabbis make fun of Christians for thinking that the Messiah could have been born in December. This is conclusive evidence for Mather: i.e., since those Rabbis say so, it must be true. Therefore the Christ could not have been conceived in March or born in December. But what is at issue here is not when the events actually happened. What is at issue is when did the Church first begin commemoration of these dates. Mather's objections include claims that December 25th was a pagan celebration usurped by the Church, but we have demonstrated elsewhere that each of Mather's specific claims lack any historical merit. 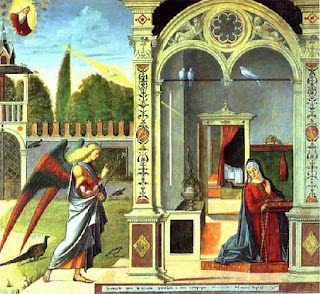 March 25th has been established as the date of the Annunciation since the end of the 2nd century A.D.
Hislop states: "The Scripture gives no clue at all in regard to the time." This is patently false. Luke 1:5-12 record that John the Baptizer's father was of the family of Abijah, it was his turn to be in the temple to offer the incense. Hislop stated: "that very day now set down in the Popish calendar for the 'Annunciation of the Virgin' was observed in Pagan Rome in honour of Cybele, the Mother of the Babylonian Messiah." In response to this second claim, no dates for this festival are recorded in Ovid's Fasti or any early Roman calendars that I could find. Even by the late 280s AD when the holiday is mentioned in the life of Severus Alexander in the Historia Augustana there is no mention of date. The Chronography of 354 AD. Part 6: the calendar of Philocalus is the earliest dating of the associated festival of Hilaria to March 25 I could find. However, the earliest sources which tie together Christ, Holy Week, Mary and Annunciation with Cybele and Attis appear to date from Damascius (458 AD died after 538 AD). So, far from pre-dating the Church's commemoration on March 25, the sources with specific dates actually come after the date had been selected. One will look in vain for the specific passages to which Hislop pretends to refer. Notice that except for Jer 44:17, all of the references are made to large works without specifying book, chapter, paragraph, page, or edition. Hislop wanted to lend the appearance of studious scholarship but did not want to get caught. He gave no specific references. The names Hislop mentions are mentioned in Macrobius, Plutarch, Ovid, and Eusebeus. But there are no dates. Hislop's etymologizing "Isis is the Greek form of H'isha, 'the woman,'" and "Osiris, as read at this day on the Egyptian monuments, is He-siri, 'the seed.'" are complete fictions. It is also noteworthy that Hislop is not concerned about consistency in his own argument or with historical accuracy when he comes to etymologizing this name again to try to make Isis equal to Ishtar equal to Ashtora and equal to Easter. Hislop also claims that "Osiris is at once the son and husband of his mother." Actually he was husband and brother of Isis; he was the son of Geb and Nut. And his wife/sister, Isis, bore his son not by means of virgin birth byt by taking his dismembered body and reconstructing his membrum phallum to impregnate herself and bear Horus. It should be fairly clear at this point that neither Mather nor Hislop had truth as their goal. Their goal was to discredit historical liturgical practices used by the Roman Church. History Channel's Ancient Aliens and other shows have given Erich von Däniken popularity again, when it finally seemed like the notion of prehistoric space aliens had finally worn out its welcome. One of the lines of evidence used by the UFO hunters is the artwork of the Christian Church--particularly when there are things that look like lasers coming from the sky. Any painting, image, or artwork that has a ray coming from heaven or a depiction of Jerusalem sitting on the clouds is automatically re-interpreted as evidence of UFOs and aliens. 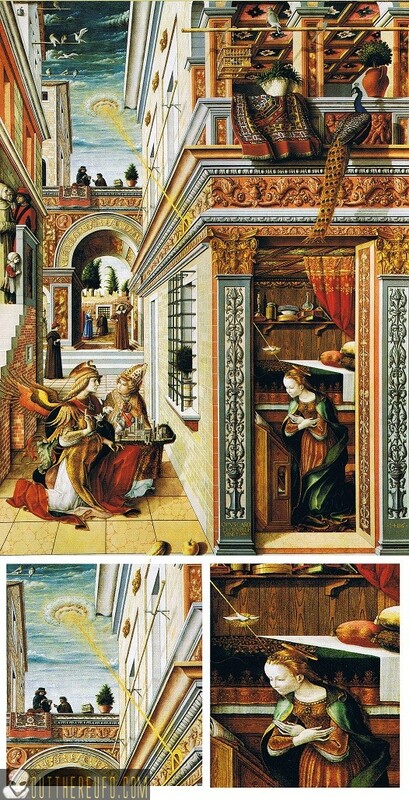 Take particularly this example made at a UFO website: The Annunciation by Carlo Crivelli, 1486. All of the symbols, the cloud, the ray of light, the dove with rays of light, and the bowed Virgin all are intended to represent the text of Luke 1. But the images are now re-interpreted as if the cloud is a spaceship, and the light is some kind of high tech ray beam. 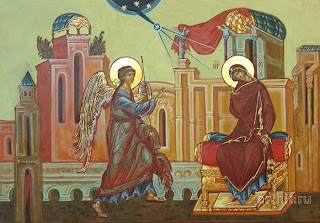 What we have seen is that the date for the Annunciation was established very early, before the end of the 2nd century. That all the claims made by the Puritans and the later anti-Roman Catholic radicals are either inaccurate or deliberately false. And following the inventive fiction of Hislop today the UFO advocates are re-inventing their own fictive history about why Christian art about the Annunciation is painted with the symbolism it has. Sometimes the familiar Scripture we grew up with is given such a bizarre twist that we are caught off guard. People tend to be trusting of something that looks like it is researched and has a seemingly sound explanation. Ironically, the more bizarre the twisting, it seems the more people cling to it. The following is an example of how the Lord's Prayer was gutted and twisted by something pretending to be a scholarly source. I picked up the San Antonio Vocal Arts Ensamble (SAVAE) compact disc titled Ancient Echoes several years ago. SAVAE intended to study A.Z. Idelsohn's musicology and create an album that made what could possibly have been the way music, particularly religious music, might possibly could have sounded like in the time of Jesus' sacrificial ministry. The instrumentation is "mostly" reconstructed period pieces. The melodies and the modes along with harmonies are "mostly" imagined. But it's a pretty good set of musical pieces even as a collection of creative anachronisms. It was the explanation of one particular piece in the CD booklet that caught my attention. The third cut is titled Abwoon (O Father-Mother of the Cosmos) The Aramaic Lord's Prayer. OK, let's be clear. The Lord's Prayer in Aramaic does not say "Mother of the Cosmos" anywhere. So I open the booklet to read what they say about this piece. Chant composed in the Ancient Dorian Mode by Christopher Moroney-Improvised solo by Covita Moroney. Aramaic is a Middle Eastern language that was the native tongue of Jesus of Nazareth, and common to the Israel/Palestine region during the first century C.E. This musical setting of the prayer of Jesus--sometimes called the Lord's Prayer--includes traditional Middle Eastern percussion, rhythms, and improvisational modal chanting. All the Semitic Languages--including Hebrew, Aramaic, and Arabic--use a root system that allows one word to hold multiple meanings. Thus, a tradition of translation arose in the Middle East that led to each word of a prophet being considered on many different levels of meaning. focus your light within us. Create your reign of unity now. from which all our actions grow. Amen. Here is a rendition of the Lord's Prayer that could make it as a part of the musical Hair--even Shaggy and Scooby could get behind this! Apart from the dismissive "sometimes called the Lord's Prayer" the booklet's description of the way Semitic Languages work is a trivializing inaccuracy that highlights the abuse of etymology in interpretation. The problem here being that this false view of language is used as an excuse to claim that the text offered here in place of the Lord's Prayer ought to be considered on the level of a translation. It is not. This so-called "translation" is a deliberate misrepresentation of the Lord's Prayer which was done to serve another purpose. This strange interpretation is not due to any unique feature of Semitic languages (Aramaic, here). This strange translation does not have any basis in the Aramaic text of the Peshitta (the Aramaic Bible used by the Syrian Christian Church). The Aramaic text says the same thing the Greek text says, and the same thing the King James Version says. Nor is this strange interpretation due to any historically demonstrated tradition in the Syrian Christian Church (which uses Aramaic). Soma and Psyche: the human relationship to being embodied: breath, flesh, perception of movement, sensation, emotion, intuition, vision and dream. Ecos: the human relationship to its home communities, which include both nature and culture, as well as the influence that each can have on the other. Art and Creativity: the human relationship to creativity,which emulates that of the cosmos itself, and leads to a natural sense of ecological, social and moral responsibility, revealing the purpose in life of each human being. Devotion: the human relationship to relationship itself: the recognition that “I” am not alone, “you” are not alone; that “I” and “you” are, as the Sufi poet Shabistari wrote, only “delicate holes cut in a lampshade” revealing the light of intelligence itself. A religionist might call this “God” (or “Goddess”); an atheist might call it “the eternally evolving nature of matter.” These names are themselves only more holes in the lampshade. Action: Real reseach [sic] is action research: learning as one goes along and taking responsibility for the social and political impact of one's study and experience. His own projects include the incorporation of spiritual dance with his re-interpretation of prayers from almost any source. The projects include the above mentioned EIAL, International Network for the Dances of Universal Peace, Edinbrugh International Festival of Middle Eastern Spirituality and Peace, and the Abwoon Resource Center. My reason for bringing out the background of the man who created this rendition of the Lord's Prayer is to highlight that integrity to the original text and original meaning had no bearing on Klotz' translation. Quite simply, the original intent was irrelevant. What he produced was a lyric of anti-Christian Newage ecumenism and Socialist politics. This is just one example of how the world twists God's Word for its own purposes. The old question is still the question at the heart of the matter: "Did God really say...?" When it sounds different, go back to the Scripture. An excellent article on the problem of allowing "just a little" bad doctrine into the Christian message and Church, by Rev. Dr. Matthew Richard, pastor at Zion Lutheran Church of Gwinner, ND: LC-MS.
" I can recall hearing, as a first year seminarian, one of my professors criticize Pastor Rick Warren’s book The Purpose Driven Life. Upon hearing this critical assessment, I was deeply angered. I thought that his actions were severely inappropriate and that it was not proper to disparage another fellow Christian who was simply attempting to promote the Christian faith. From my reasoning, the presence of a Christian voice was better than the absence of a Christian voice and it was certainly better than a voice speaking contrary to Christian truths. Even though my professor took the time to show me the countless errors in Warren’s book, I still concluded that a faulty Christian voice was better than no Christian voice at all. Besides, I felt that is was rude, insincere, and un-ecumenical to criticize those within the Christian sphere; we are all on the same team after all trying to do our best for God. 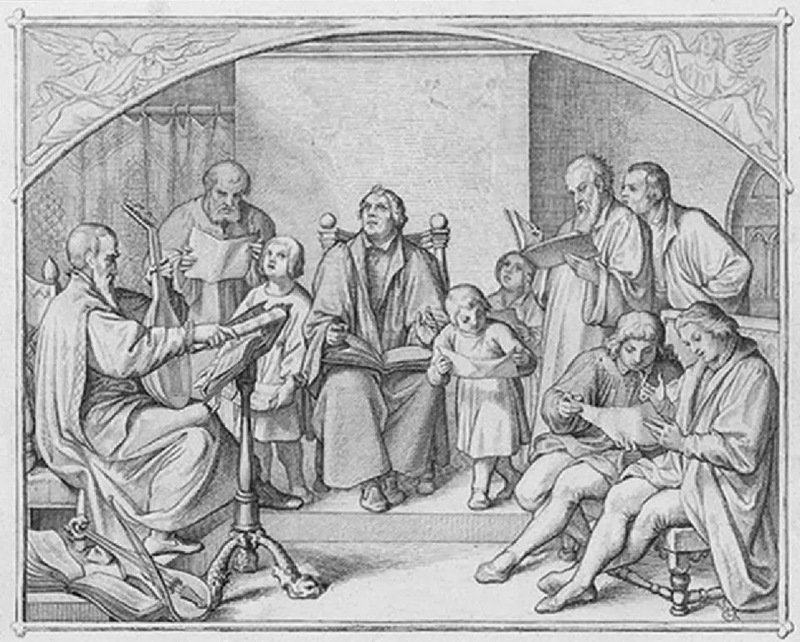 Dr. Martin Luther's Small Catechism has been associated with the season of Lent since the time Luther first published in chart in time for Lent in 1529. This schedule misses two parts: Daily Prayers, and The Table of Duties. These are covered elsewhere in the Church Year (Daily Prayers on Easter 6: Rogate, Table of Duties on Trinity 23). While teaching the parts of the Catechism it is important to keep the whole in mind to understand how the parts relate to each other and why they are there. The division of the Small Catechism into six chief parts plus the three extra parts gives us a convenient mnemonic device. That mnemonic device is, The Trinity and the Number 3. One can remember that there are three sections of the Small Catechism with Three Parts each. The first section focusing on the What of the Christian Faith. The second section focusing on the How and Where of the Christian Faith. The third section focusing on the Application of the Christian Faith. These parts all are quotations from Scripture. The Commandments are from Exodus 20 and Deuteronomy 5; the Creed is a narrative chaining of quotations from many different passages through Scripture; and the Lord's Prayer is found in Matthew 6 and Luke 11. This first section gathers the teaching of Scripture on the substance of the Christian Faith: The What. So we ask "What does this mean?" In three consecutive sections we are confronted with the Law, The Gospel, and the Response of Faith. The Ten commandments teach us about the problem we have with God and our neighbor. This is the Law. The Creed teaches us about the solution God provides through the Father's creation, providence, preservation and the specific saving work of the Son of God Incarnate for us; and the work of the Holy Spirit in calling us into this faith and preserving us in this faith until the resurrection. The Lord's Prayer is where Christ teaches us how faith in Him responds to God's Grace. Because we have been made alive and declared innocent through faith in Christ, we are now His brothers and sisters by this divine adoption. We may now call Christ's Father "Our" Father. An unbeliever may use the words of the Lord's Prayer, but an unbeliever never can pray to the Heavenly Father. For prayer is a response of faith in Christ alone. Error creeps in when one or more of these three parts is replaced with something else--as when God's work of eternal redemption is reduced to a formula for some benefit in this world, or when the Law is taught as a means of salvation, or when some Commandment is ignored or a statement of the Creed is denied. Error also creeps in when the proper relationship and balance between these three parts is changed--as when the Law and Gospel are confused or not properly distinguished, or when prayer is made into something other than simply the Christian's response of faith. These are the Gifts given by Christ that we call the Means of Grace. That is, these are the ways Christ said is "How" He gives us faith, the forgiveness of sins, and everlasting life. These gifts of Christ show us "Where" we may find God's grace. So we ask "Where is this written?" In this second section we are directed to the very words Christ spoke when He gave His promise of grace and forgiveness through these Means of Grace. Attached to these words in Scripture is His promise that these gifts are what He says they are, and that He actually gives and does what He promises through these gifts. Each of these three parts brings us to focus on the Scripture that shows that these Means of Grace are not works that we do to participate in or earn our salvation. The Scripture cited shows that these Means: Baptism, the Keys, and the Supper are God's works for us and among us. Christian faith is built only by God. God promises He will create and sustain faith through these visible Means. He gives us these gifts in His written Word. And these gifts are His visible/audible application of that same Gospel. Error creeps in when an individual does not believe the promise Christ gave and recorded for us in Scripture about these Gifts. When we doubt God's Word about how He gives grace, forgiveness, and eternal life through these gifts of Word and Sacrament, then we are despising God's grace. This happens when people view the Means of Grace as merely symbols of God's love rather than as the actual Means where God says He gives His grace. Error creeps in when Baptism, Absolution, and the Supper are twisted into works of human righteousness rather than God's works for sinful humans. That is, what the Bible says about the work and grace of God in these gifts is denied when we think of the Sacraments as things we do to show God that we are sincere, dedicated, or obedient people. These gifts, the Means of Grace, are the heart and center of the assembling of believers for the Divine Service. Baptism, the Office of the Keys and Confession, and the Lord's Supper are, in fact, the preaching of repentance for the forgiveness of sins. These gifts are the only God' given Means through which God says He gives us His grace. And His Word and Sacrament are the only place we can go to grow in faith in God, and in knowledge of His will and promise. Do you wish to know how to find God? Where can we seek His grace and kindness? Here is where God says His grace may be sought. Here is where He promised to be found. This is how He builds you up, creates faith, forgives, and causes you to inherit eternal life. This section focuses on the application of Law and Gospel and of the Means of Grace upon our every day life as Christians living in the fallen world and waiting for the Resurrection. As an application, these three parts are essentially describing how a the faith of a Christian responds to God's grace under the Cross of Christ. The threefold presentation of this response of faith is arranged in a way that shows how the application of our faith in life directs us to focus back again to the Means of Grace as the place where God comes to us to give us life, forgiveness, and redemption. First, we are directed to develop the Christian habit of prayer every day combined with learning from God's Word and reflecting on the Law and the Gospel. Second, in the Table of Duties we are directed to Scripture so we can understand our every day calling and duties as citizens in of the three main kinds of authority God has established: Church, State, and Household. Here we learn from Scripture the nature and limits of these kinds of authority, and our obligations as we live in each of these separate estates. And third, The Christian Questions and Answers bring us to recognize our need for God's grace to us, to encourage us and prepare us for a Scriptural trust and regular reliance upon that Grace given to us in the Lord's Supper. This section highlights life under the Cross of Christ and the source for our life. It directs us to live lives of thanksgiving for God's grace to us both in His providence and in His saving Grace through Christ. In this part we are directed not to hope that this life is all there is, but that through Christ and His Means of Grace God does secure us for the resurrection to eternal life. In our parish, as Lent begins on Ash Wednesday with a call to repentance, the First Chief Part-The Ten Commandments, are read responsively. The call to repentance is based in the actual declaration of the Law of God and not upon any contrived law or regulation of sinful man. As the season progresses so also the whole counsel of God is presented leading to the focus in the last week upon the Lord's Supper. On Maundy Thursday the Christian Questions and Answers are read responsively as part of the Exhortation for the Lord's Supper. All of this is preparation for four things: first is to help us properly focus on the Passion, Death and Resurrection of Christ, the benefits of which we receive through the Means of Grace. Second is to help us to appreciate the great salvation the Eternal God won for us by His incarnation, humiliation, and conquest of Satan, sin and death. Third, is the help prepare us for this life or repentance and dependence upon God alone under the cross-in the case that Christ does not call us home. And last, to help prepare us for our death and resurrection, that we may be dressed in the bridal gown of our Baptisms in Christ's righteousness and not our own as we are called before the throne to be with Him in eternity. Christ didn't command any such celebration. Christ did not command His followers to celebrate Ash Wednesday. Nor did he command that we worship on Sunday. Nor did He command that we sing “Rock of Ages.” Nor did he command that we use chairs or pews when we gather. The false logic is this: If Christ didn't specifically command us to do something, then it is a sin to do it. So, think about how little sense that logic makes. Take this example: Christ did not command that I have my children wash dishes. Is it therefore a sin to have them do so? No. The 40 day fast does not come from the so-called “weeping of Tammuz” as claimed by the radical anti-Roman Catholic writer Alexander Hislop in his book The Two Babylons. Hislop made up myths and connections out of thin air because of his hatred for Roman Catholicism. Hislop's views were adopted whole cloth by the Jehovah's Witnesses, who continued to republish Hislop's book until 1987. Hislop's book was cited in 22 different issues of the Jehova's Witnesses periodical The Watchtower from 1950 to 1978, and several times in the 1980s. From 1989 the Jehova's Witnesses stopped referring to Hilsop's book, but they have kept Hislop's teaching and use other sources.